What most people don’t know is that above all Ljubljana has one of the biggest shopping complexes in Europe. This is BTC City, located in suburbs, that spreads on a little less than half a million square meters. Retailers, shopping centers, car washes, restaurants, clinics, cinemas, swimming pools, hundreds of car parks, everything is at your fingertips. It scares me a little bit, because it spreads without even noticing. Skyscrapers grow out of nothing. 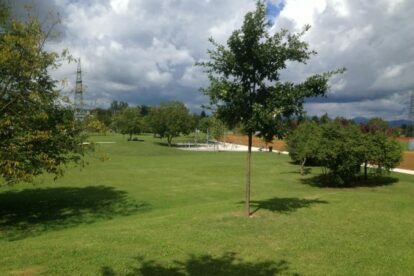 There are only a few places we can go to avoid constant euphoria and shopping rush, and one of them is Šmartinski park. Just a few years ago, there were little urban gardens, cultivated by the citizens. But the late mayor forced them to remove their belongings and then demolished the place. What came out of this is the new park. It is becoming popular among neighboring citizens, especially since municipality built big children’s playground that attracts families from around. Even though the mayor could’ve let some parts of the park untouched or transformed it into community gardens. Now, there are only some (fruit) trees and bushes that provide shade, and in the later summer and autumn the apple, pear, apricot and cherry trees bend from the ripening fruits. It is big enough to play football or a game of frisbee in. Since The park also neighbors Žale cemetery, designed by architect Jože Plečnik, which are also worth a visit (after shopping, if you really intend to).